Sunday April 7, 2019, Iowa saw our third National Oratorical Champion crowned. 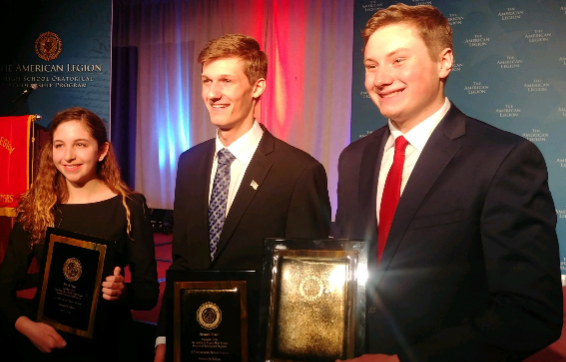 Patrick Junker of Van Meter, Iowa joined Jennifer Demmon of Marshalltown in 1986 and Max Miller of Ankeny in 2000 as Iowa’s National Oratorical Champions. Patrick is shown on the right in the picture above. To his right is runner-up Caleb Maue of Illinois with Eden Carnes of Tennessee finishing third. Patrick is the winner of an $18,000 scholarship with Caleb and Eden receiving $16,000 and $14,000 scholarships for their efforts. Patrick will be honored as one of The American Legion’s Youth Champions at the 2019 National Convention in Indianapolis. He is a junior at Van Meter High School with aspirations of possibly attending one of the military academies after high school. Patrick was also selected as one of Van Meter’s delegates for the 2019 American Legion of Iowa Boys State program. To watch and listen to his speeches, follow this link.